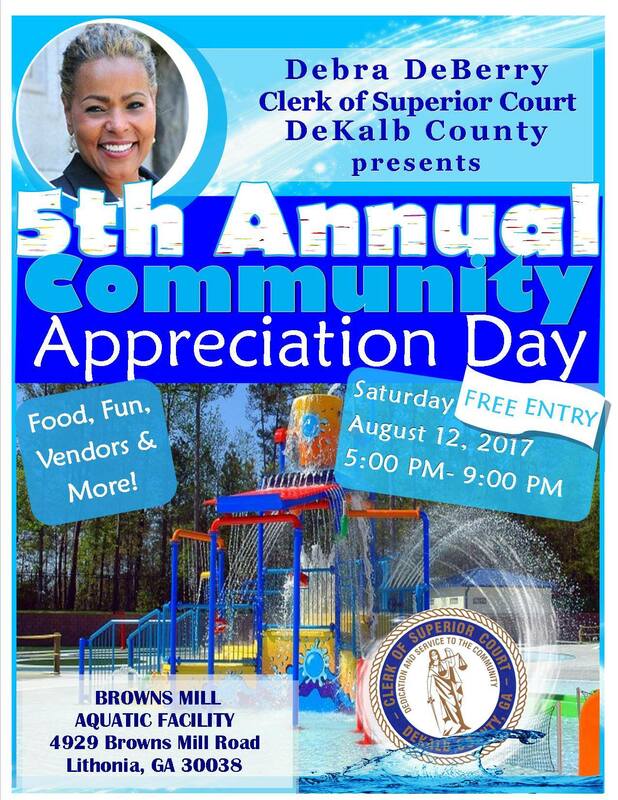 Debra DeBerry hosts Community Appreciation Day Saturday, August 12, 2017 DECATUR, GA – DeKalb County Superior Court Clerk Debra DeBerry is hosting the 5th Annual Community Appreciation Day. The special event will include complimentary entry into the Browns Mill Aquatic facility, a complimentary food ticket and music. The family-oriented event is designed to thank citizens for their ongoing support. For more information on Community Appreciation Day at Browns Mill Aquatic Facility, please call Debra DeBerry’s office at 404-371-2251. Event: Community Appreciation Day Date: Saturday, August 12, 2017 Time: 5:00 pm – 9:00 pm Where: Browns Mill Aquatic Facility 4929 Browns Mill Road Lithonia, Georgia 30038 .